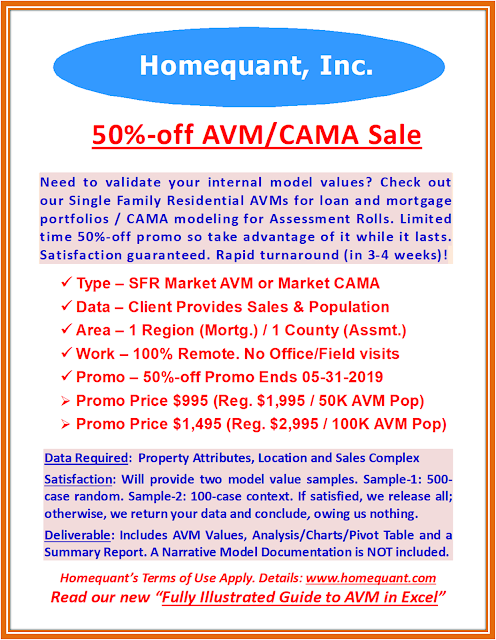 Housing market is primarily about "location, location, location." 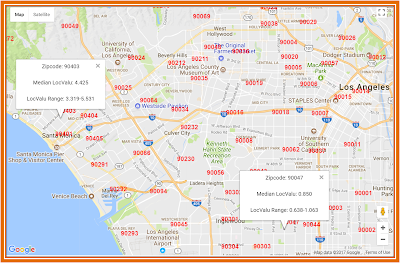 Most homebuyers do not understand the impact of location on home values; instead, they tend to get carried away by size, age and condition, ignoring the biggest contributor to the value, i.e., location. In the first graphic above, all others factors remaining constant, a $4.425M home in inland Santa Monica (Zip 90403) becomes $850K in LA South (Zip 90047). 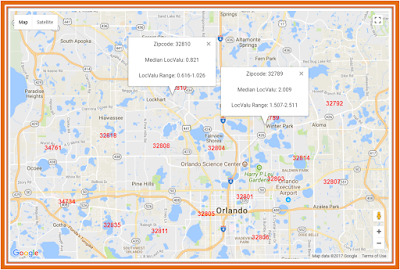 Similarly, in the second graphic, if a house is moved from Zip 32789 to 32810 - across the I-4 freeway - its value goes down from $200K to $82K due to change in location. 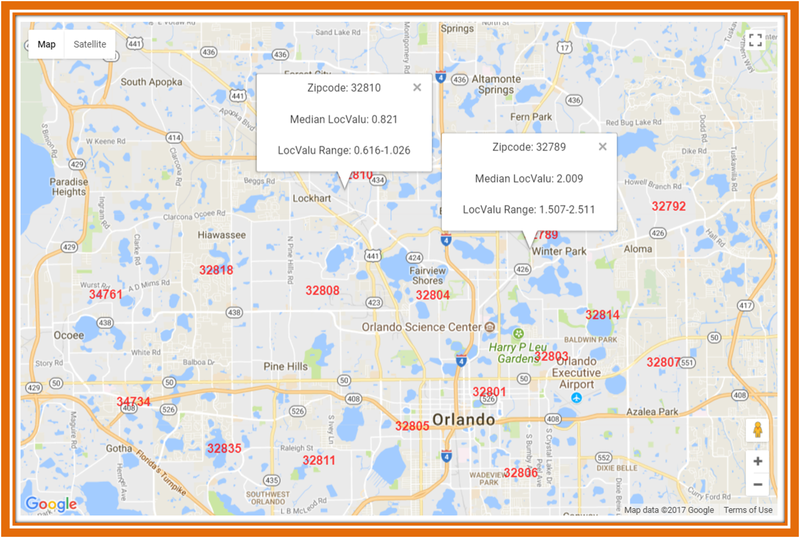 The above spatial graphic shows how the five contiguous Zip Codes have vastly different residential location values, ranging in value between 0.50 and 2.0 -- a whopping factor of four. In other words, a $500K house in Zip 32808 would jump to $1.68M in 32804 and to $2M in 32789 and so forth. 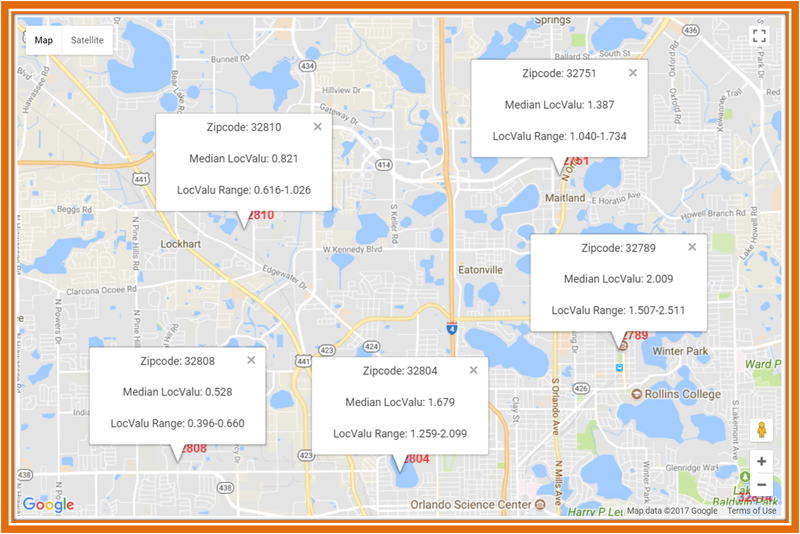 One of the easiest and quickest ways to understand the residential location value is to study the published median home values by the Zip Code. Of course, another step is required to derive (a simplistic form of) location value for the Zip. 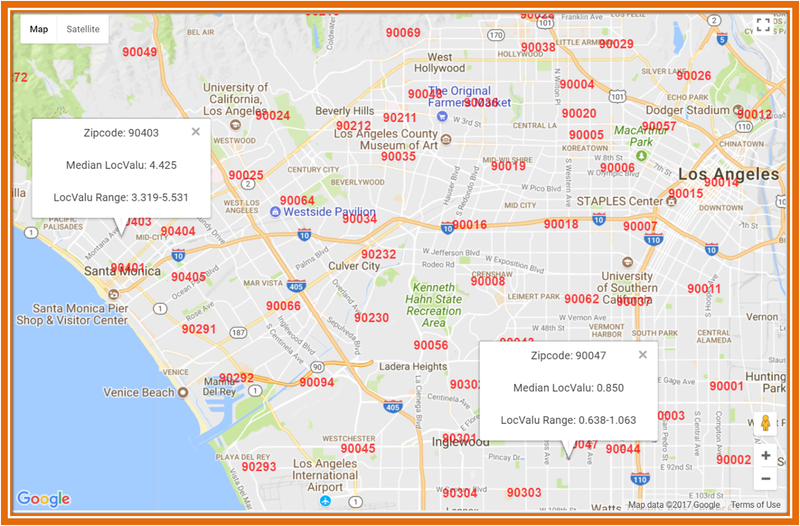 The Zip-wise median home value needs to be normalized (divided by) by the median heated area (square feet) so the location value comparison becomes apples-to-apples. I picked the above graphic from LocValu.com as I own and operate it, to avoid having to deal with any unintended copyright issues. My LocValu site is totally self-directed (no modeled values), totally free (no strings), and requires no registration/log-ins whatsoever. Please use the site/system that works best for you. Disclaimer: This analysis is strictly illustrative. Any commercial or legal use of it is totally prohibited. Always consult a Tax Attorney on statutory requirements.